This is a follow on from my last post, concerning the mapping of my paper ancestry over the past three centuries. A noticeable cluster of ancestry (on my mother's side) appeared on the maps from three generations ago, in Broadland or East Norfolk, including the villages of Reedham, Limpenhoe, Cantley, Freethorpe, Stokesby, Beighton, Postwick, Hassingham, Buckenham St Nicholas, Halvergate, Tunstall, South Burlingham, Moulton, and Acle. That this cluster is so firmly entrenched, suggests that I have had ancestry in that locality for a long time. 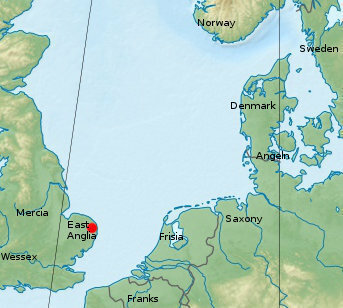 I have already postulated that this area would have acted as a prime settlement district for immigrants from between the fourth and eleventh centuries, from across the North Sea. I thought that I would play on this idea a little more. The red dappling, outlines the main cluster of my mother's paper ancestry, that provenances there during the eighteenth and nineteenth centuries. Such a strong cluster would suggest deep roots in that zone. Very different to the present day Norfolk Broads and Coast. Great Yarmouth and Breydon Water are replaced by a Great Estuary. Reedham literally faced the North Sea at the head end of the estuary. 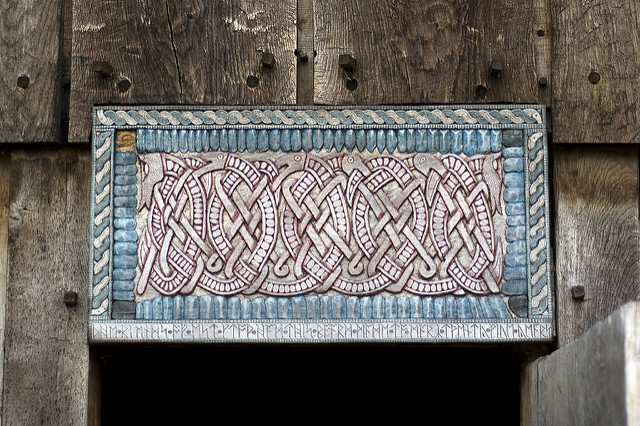 Indeed, 20th Century works in the parish church of Reedham, revealed hidden herringbone decorations made from Roman bricks. it has been hypothesised, that these bricks may have come from a nearby Romano-British lighthouse. 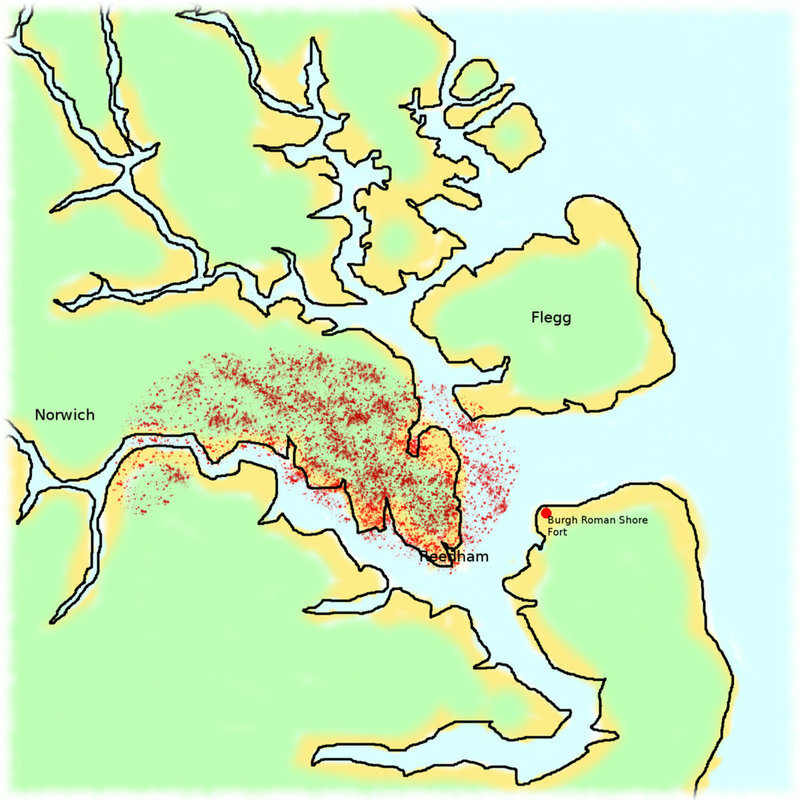 Revisionist historians and archaeologists have for many years, argued that the Roman forts of the Saxon Shore, were in fact not defensive, defending the province from attack by marauding Anglo-Saxon pirates, but were instead used to control and tax North Sea trade with the province. Some have even gone so far as to suggest that areas like this were already being culturally influenced by the North Sea Anglo-Saxon world. The collapse of Roman administration, and the disintegration of much of Roman society, and the Roman way of life, made it easy for Continental adventurers to cross the North Sea from outside of the old Empire, and to settle in Eastern England. Some of them may have been escaping exploitation from the elites that were gathering power in their homelands. They knew how to live with a rural barter-economy, without the niceties that the Empire had offered the British. A recent study of human remains in the Cambridge area, noted that within a very short time, even the local British were adapting the customs and artifacts of Anglo-Saxon culture. Not only that, but those remains that were genetically profiled as of being of local British origin not only aped the new immigrants, but their burials were higher status and richer. 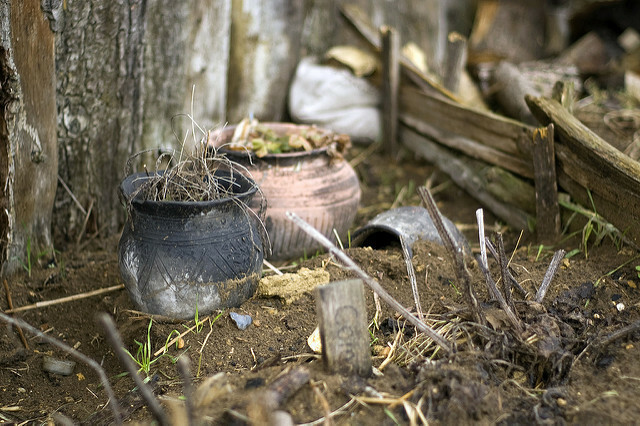 The poorer graves mainly profiled as newly arrived immigrants from the Low Countries or Denmark. The researchers suggested that in the case of immigration (rather than invasion), this is what we should expect to see. The immigrants had to settle for whatever they could get, which would often be poorer land. I'm going to restate my view. I support a number of recent genetic surveys, also backed up by many archaeologists, that the 5th Century AD Anglo-Saxon Invasion of Britain was exaggerated in it's ferocity by Gildas and Bede, rather like the Daily Mail exaggerates present day immigration and it's "damaging effect". It was certainly a very major migration, but it appears to have left the lowland British genome with no more than 20% to 40% of it's DNA share. It seems from recent genetic studies, that the present day ethnic English, inherit more DNA from prehistoric British populations, than they do from Continental Anglo-Saxons. Not only that, but the immigrants seem to have married into British society, rather than slaughter it. It was during the later Sixth Century, that emerging elites of the lowland British kingdoms started to claim ethnic identification, and descent from heroic Angles and Saxons. In this post, I'm not going to particularly distinguish between the Anglo-Saxon settlement of the 5th/6th Century AD, from the hypothesised Danish settlement of the 9th/10th century. Perhaps we should see them as waves of North Sea immigration, but perhaps not so entirely divorced from each other. The earlier may have originated more from Frisia and Angeln, and the latter from a little bit further north in Denmark, but the cultures don't seem to have been that much different. When I was a boy, travelling through the loam soils of Broadland to see my relatives in Cantley, I was always struck by the big Dutch barns on the landscape. I was told that the Dutch had long had connections to the area. Maybe my parents underestimated how far back these links across the North Sea went. This 20% to 40% Anglo-Saxon DNA spreads across all of England. Even the Welsh and Cornish have a percentage of it. However, I was intrigued by a comment in Stephen Oppenheimer in his book Origins of the British 2007, when he did just remark that the highest marker was from an East Norfolk sample! When I look at the above maps, and in relationship to Frisia, Saxony, Angeln, and Denmark, it appears to me that the Great Estuary must have seemed like a magnet to the boat loads of new settlers. Rivers opening up from the North Sea, to rich arable soils and lowlands. A recently closed shore fort - tax, customs, and immigration control free! I can't help but imagine the first boats beaching or mooring at Reedham, Cantley, Halvergate (-gate, another Norse place-name) etc. Not only that, but during the 6th and 7th centuries, the sea levels dropped. Desperate settlers could easily create new land with simple drainage methods. This appears to be particularly relevant to the East Norfolk district of Flegg. An island surrounded by new marshes, with the sea waters draining away. Almost every parish on Flegg, finishes with the classic place-name suffix of Danish settlement - Fil-by, Stokes-by, Rolles-by, Ormes-by, Hems﻿-by etc. That the later settlers left so many place-names must reflect a great land grab by immigrant families. The settlers had to fit in where they could. their ability to exploit a drop in sea levels, and to perhaps make use of their engineering skills at draining land, must have been an advantage at settling in this area. The drained salt-marshes proved top quality grazing land. 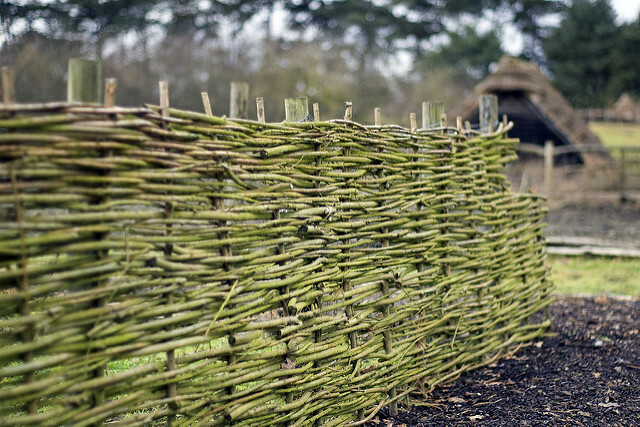 The marsh grasses of the Halvergate Triangle were used to fatten sheep, cattle and other livestock for centuries after. The marshes are dotted by small medieval man-made islands known as holmes (from the Old Norse holmr). I've basically been making claims here, of direct descent from the North Sea Settlers that arrived in the eastern extremes of East Anglia between the 4th and 11th centuries. I'm daring to suggest that my mother's established deep links with that area, may indicate that she has a heightened percentage of their DNA. Of course, I could be wrong. Perhaps there was more shuffling of genes across Britain into and out of that district during the medieval. Perhaps the POBA 2015 survey was correct in dismissing any Danish settlement. Why does it matter to me anyway? I am equally proud of my Romano-British ancestry as I am of my Anglo-Saxon (or perhaps Anglo-Danish) ancestry. The Romano-Britons seem to have largely descended from late prehistoric Britons - the people that erected all of those round barrows across Britain, that went on to build wonderful hill forts, the people that rebelled against Rome during the 1st Century AD. However, I'm also proud of having North Sea settler ancestry. They were the go-getters of their day, that uprooted to look for adventure. Hard working migrants and pioneers. Perhaps similar in some respects, to the Europeans that uprooted to settle the Americas, or dare I suggest, to the present day EU immigrants of Britain. Years ago, I read a fascinating landscape history on this area, called The Norfolk Broads, a landscape history. By Tom Williamson, 1997. Unfortunately, I lent the book out. I really would like to read this again now.